Traditional Easter recipes are enjoyed around the world by all countries celebrating this special day. Most of these countries have a traditional meat, a traditional bread and traditional cake recipe along with many other dishes. In my home, we always had ham for Easter and I still do. Side dishes included mashed potatoes, sweet potatoes, several vegetables and tossed salad; we always had several types of breads. The biggest traditions came by the way of desserts and candies. I always wanted to learn how to make marshmallow because my mom always loved the chocolate covered marshmallow eggs and bunnies. She also liked the chocolate covered cream eggs; I would say these are traditional candies because I am guessing but I bet her mother loved these also. As far as desserts, I would say my cream meringue pies are my traditional Easter recipes for dessert and have been for years. I always bake five pies for Easter; one chocolate, one lemon, one banana, one butterscotch and one coconut cream. Most people in the United States celebrated the crucifixion of Jesus in the same basic way as I did my whole life. Friday before Easter we would celebrate Good Friday with a special dinner and church service in the evening. Saturday was spent preparing for the next day which is Easter Sunday. Sunrise services begins around 6:00AM Sunday morning to celebrate and explain what is the Resurrection of Christ. After the service, in years past, many people would come to my house for Easter breakfast, which was a nice buffet with traditional Easter recipes, coffee and juice. After breakfast we would return to the church for our regular service; then back home for Easter dinner. As you can see, everything centers on food! Many years ago, if you were traveling by train on Easter, you may have eaten French toast in the railroad dining cars. This recipe was a favorite of the old traditional Easter recipes for breakfast served on the trains. Spread bread with softened butter. Mix cinnamon with brown sugar; sprinkle half of buttered bread with sugar mixture. 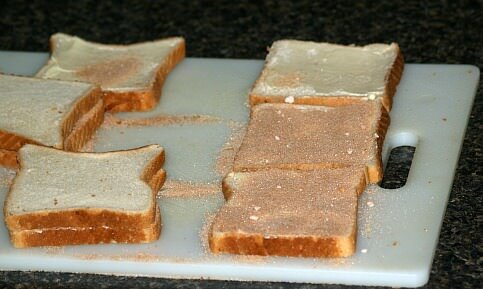 Cover sugared sliced with remaining slices of bread making sandwiches. Cut sandwiches into quarters; from corner to corner making little triangles. Mix together flour, salt and baking powder; add egg yolks, milk and melted butter; blend well. 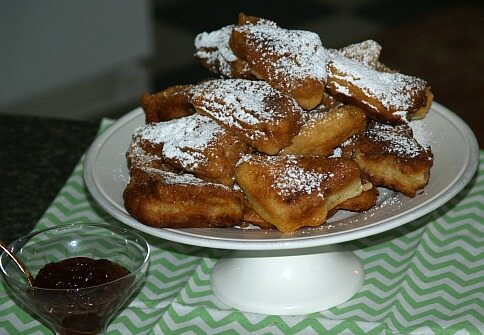 Beat egg whites until stiff and fold into batter; dip each sandwich into batter coating well. Fry in ½ inch of oil and butter in hot skillet until brown on both sides. 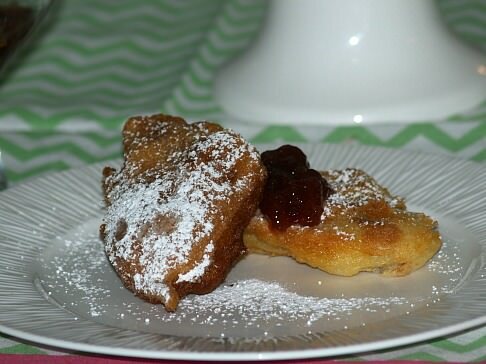 Drain on paper towels and dust with sifted powdered sugar; serve with jam. Of all the countries which celebrate the Resurrection of Christ on Easter Sunday, many of them celebrate pretty much the same way as I have always done. The two meats that are generally served in all the countries are ham and lamb. Some countries do have pasta dishes as the main course. Most of the countries prepare boiled eggs (Easter eggs) with pretty Easter egg dye like we do in the United States. However some only make the eggs red, signifying the blood of Christ, while we do assorted colors. Most countries also have in their homes favorite traditional Easter recipes for candies, cakes and breads, both sweet and yeast breads. Mix together yeast and warm water; stir in sugar, shortening, dry milk, salt and cardamom seeds. Stir in eggs and flour. Knead on floured surface; let rise twice. After second rising knead again and divide dough into two equal parts. Divide each of the two parts into three parts; shape into ropes and braid. Place ropes on lightly greased 10 ½ X 14 inch sheet pan; let rise 30 minutes. Bake in preheated oven at 350F degrees for 15 minutes; brush tops with milk and sprinkle with sugar. Celebrating Easter in Italy might start the morning with a traditional Easter recipes for breakfast. On the menu, they could have a large skillet with eggs, sausage, pepperoni, onions and peppers; all fried together in a frittata. They probably will also serve sliced fresh fruit and fresh juice. Like most other countries they will have plenty of their favorite homemade Italian cakes, Italian bread recipes and traditional Italian pie recipes. Soak the wheat in water overnight. Combine flour, butter, 1/3 cup sugar and 1 egg yolk to make a dough; form into ball and set aside. Drain the wheat and combine with milk, orange rind and 1 tablespoon sugar. Cook over low heat until mixture creamy and thickened like cereal. Combine ricotta, 3 egg yolks, remaining sugar, wheat mixture, orange juice, candied fruit and cinnamon. Beat egg whites until stiff and fold into mixture. Turn mixture into pie shell; make lattice with extra dough on top if you like. Bake pie for 1 hour; cool few hours before serving. Traditional Easter recipes in Germany might include deserts made with a marzipan recipe, an Easter pie or cake recipes like a kugelhopf cake. German dishes for dinner will probably include a ham recipe, some homemade noodles and greens. Dishes made with eggs such as beets and eggs will be plentiful. Topping off the day, chocolate eggs will be available. Being of German decent, most of these recipes were in our home at Easter. The one exception is the desserts with the marzipan; maybe they were too much work to make but we never had this type of dessert in our home. We always did have desserts made with apples as you will find true in many German homes. Grease and flour Bundt or tube pan. Beat eggs and oil until foamy; add sugar and vanilla and beat 5 minutes. Blend in flour, soda, cinnamon and salt; by HAND mix in apples and nuts. Spoon batter into prepared pan; bake 1 hour or until pick comes out clean. This Russian Easter recipe is referred to as bread or a cake. Sprinkle yeast over warm water in a large bowl; stir until dissolved. Add sugar, salt, butter and eggs; add 2 ½ cups of flour and beat until smooth. Stir in fruit, nuts and peels. Gradually add remaining flour mixing until dough leaves sides of bowl. Turn dough out onto a lightly floured surface; cover with bowl and let set 5 minutes. Knead dough until smooth; place in a lightly greased bowl. Punch down dough and turn onto lightly floured surface; divide dough into thirds. Shape each part into a smooth ball; press into each can. Bake 30 to 35 minutes until browned; cool on rack 5 minutes. Remove from cans and finish cooling on wire rack. Frost while warm with Kulich icing. Like in Germany, here in the United States and many European countries, ham is served in Russia for Easter dinner; often baked in a crust. For traditional Russian recipes also on the menu you will find a variety of fresh desserts from kulich to Paskha, the Easter cheesecake. Many also serve pirozhki which is a baked or fried dough either stuffed with sweet fruit fillings or vegetables and meats. In France you might start the traditional Easter recipes off with the famous French toast and quiche Lorraine. The British recipes could be a Simnel cake recipe or hot cross buns, which are enjoyed in many of the European countries. The Irish will probably be serving leg of lamb with potatoes for dinner. For snacking there will be plenty of Irish potato candy shaped like Easter eggs. Moving on to the South American countries, they have their way of celebrating Easter. Again centering on church services, special dinners are served in homes around these countries. Most will be serving some form of lamb, maybe lamb chops. A favorite dessert of many of these countries are favorite flan recipes.